A period of relative inaction followed the Americans’ modest success at Harlem Heights on September 16, 1776. Both sides plotted strategies and speculated about the cause of the conflagration in New York City on September 21. George Washington communicated some of his woes to Congress, arguing for the creation of a permanent army; short-term enlistments and the uneven quality of popularly elected militia officers were especially troubling to him. William Howe lurched back into action on October 12. He hoped to avoid a costly direct assault against the Americans, who were entrenched in hilly northern Manhattan. Instead, Howe executed a flanking movement, sending his soldiers by boat up the East River, through Hell Gate and onto Long Island Sound. Soldiers were landed first at Throg’s Neck and later at Pell’s Point. Washington was aware that the British were massing behind his lines. On October 23, he left 2,000 of his best soldiers at Fort Washington in northwestern Manhattan and began a march with the reminder of his force northward into Westchester County. Progress was exceedingly difficult. The Americans had few horses and were forced to move many of their cannon by hand. Safety of sorts was found in the hills outside of the village of White Plains. Following several days of skirmishes, significant fighting occurred on October 28, particularly on Chatterton’s Hill. In the Battle of White Plains, American forces were dislodged from their position, but once again Howe failed to pursue his opponents and waited for reinforcements. By November 1, the British were ready to resume their offensive, but a heavy wind and rain storm slowed their progress. Washington took advantage of the British lethargy and retreated northward to another hilltop location, this time about five miles away near the town of North Castle. Washington and his dispirited army believed that a major, perhaps decisive, battle would occur within the next few days. To their utter amazement, dawn on November 4 brought the sight of the British turning their backs on the lightly entrenched Americans and beginning a march back to Manhattan. 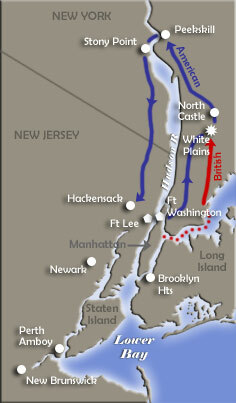 Washington made a crucial decision to divide his army and led about 2,500 men into New Jersey. A larger force of some 11,000 men was left under the command of the erratic Charles Lee and was responsible for halting any future British advance into New England. After the Battle of White Plains, Howe next turned his attention to the small American presence at Fort Washington.